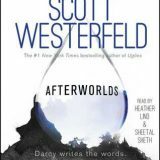 I was so excited when I received an audio copy of Afterworlds by Scott Westerfeld. The synopsis intrigued me, and I dove into the audio with such anticipation. Despite a stellar performance by narrators, Sheetal Sheth, and Heather Lind, the overall stories feel flat for me, making the story unmemorable.